The new Green Start book series from Innovative Kids is perfectly designed to help foster childrens’ awareness of the natural world. 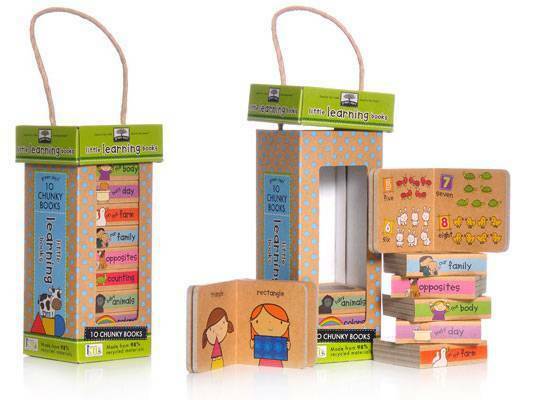 This earth-friendly collection of childhood books is made from 98% post-consumer recycled materials and is printed with eco-friendly ink. Each book features age appropriate learning for tots and includes a parent’s reference guide at the back that shows parents and caregivers how easy it is to be green! The Green Start series features titles that inspire eco-friendly behavior and basic child development skills in your little one. For example One Tree teaches children that a single tree is the center for a whole world of life and explains that animals, insects and humans all depend on trees throughout the year. In Little Helpers, kids will discover that the little things we do every day can make a big difference in helping our Earth. Kids will learn about recycling, picking up trash, planting trees and flowers and more. There are 6 fun single titles in all — or you may choose from two different sets of block books (which include ten books per set). Innovative Kids also offers handy educational green living tips and eco-activities to complement their books. You can access these green living tips for free at Innovative Kids. The new Green Start book series from Innovative Kids is perfectly designed to help foster childrens' awareness of the natural world. This earth-friendly collection of childhood books is made from 98% post-consumer recycled materials and is printed with eco-friendly ink. Each book features age appropriate learning for tots and includes a parent's reference guide at the back that shows parents and caregivers how easy it is to be green!